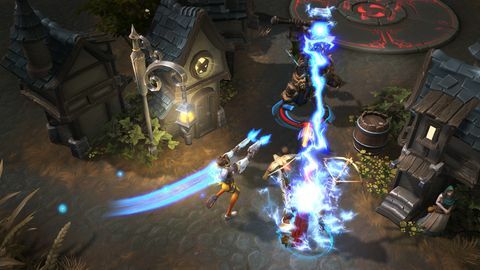 Chris meets with Blizzard technical director Alan Dabiri to discuss the first 18 months and immediate future of Heroes of the Storm. Q: Blizzard is celebrating its 25th anniversary and you've been with the company for most of that. Can you tell me what it's been like working for Blizzard over that time? Alan Dabiri: It's been fantastic. I think it's a testament that fact that we have people like me and others that have been for that long. The company has been through so much growth, released so many great games, and our fans are fantastic. I've loved it, it literally like my second family. Q: Why are there are so many like yourself that have been with Blizzard for five, 10 or even 20-plus years? Alan Dabiri: You will find a great deal of people who've been here for a long time. I don't know if you've heard about our service awards – The Sword and The Shield, and the crown and all that. Just walking around, you will see them all over the place. We just love making these games and love getting out and talking about them. We get to do cool stuff like this, and get to go out and not only be ambassadors but talk to fans. This is a company where making games is always fun and rewarding. 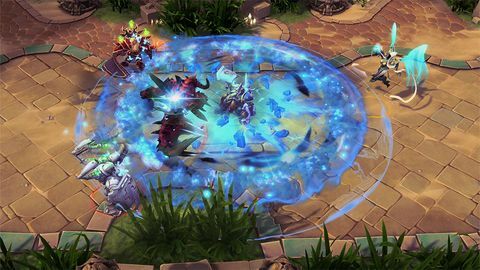 Q: What was the most important thing you learned over the past 20 years with Blizzard that you've brought over to Heroes of the Storm? Alan Dabiri: One of the cool things about Heroes is that it encompasses all of our game worlds, and having been with the company for so long, I've been able to experience all of these worlds. So being part of all of those different experiences over the years has allowed me to have that background and foundation that provides a deeper understanding when we bring more heroes to game. Like when we brought Ragnaros to the Nexus, who is this epic raid boss from WoW, it's like, "Oh yeah, I remember developing that!" The same goes for the new heroes from the likes of Overwatch: we know these characters and these worlds. All of this adds to the game, and also shows that we have this expanding roster of heroes. It truly is never-ending, and is one of the most exiting parts of working on Heroes of the Storm. Q: How has player feedback affected the ongoing development with the game? Alan Dabiri: It's pushed us more. I mean, when we started, we had our starting heroes and were doing some cool stuff, but over time we hear more and it literally pushes us more and more. So, we end up doing things like Cho'Gal which is like a brand-new thing in this space –having two players playing one hero. And now again with Ragnaros you know this epic raid boss who can take over towns, and the same thing with Varian who is a multi-class hero. Which because of the way our game works and our talent system, we can actually make a hero where based on what's going on with the game, based on what your team is doing, and based on what the other team is doing, you can decide to use different paths and really kind of pick the best path for that game. Q: Speaking of Varian and Ragnaros, you've introduced heroes that bring in not only new skills, but entirely new ways to play the game. What sort of impact do you think Varian's multi-classing will have on the game? Alan Dabiri: Well, it's going to create a lot of new dynamic gameplay. Typically, we're picking a role, right? Each hero has a specific role, you pick varying styles within that role, and our talent system allows you to do a lot of cool things with that. But with Varian, for the first time the role itself can be truly dynamic. The role itself can be: "We seem to be OK because they chose ability or talent such and such – they're not as dive-y or heavy/strong attack and I maybe don't need to tank as much, so I'm going to switch over and be more of an assassin." Or conversely: "They're jumping on Lt. Morales constantly, I need to go a tank-y build. I need to pick taunt and I need to peel those guys off our back line." So it's completely diverging in the roles now and not just with your own set role. you start just raining meteors and swiping with your hammer, you truly feel awesome. People are running from you in fear. Q: The big red machine, Ragnaros, has made an appearance. Why Rag? What was the design philosophy here, and how do you think he will impact the game? Alan Dabiri: We get a lot of feedback from players, and as we discussed earlier, we've spend years with these games and these characters, so we all have our own favorite heroes. And a lot of players have asked for one of these iconic raid bosses to be added to the game. We were like, how do we get this into the game? We went through a lot of iterations. The key thing we wanted to do to was sell you on the idea that he is this badass raid boss. And this is really shown off the most with his trait Molten Core, which allows you to take over any of your towns, or any destroyed enemy towns. Once you've done that, as an opposing team you've got this decision: should we try and fight this? Can we actually take this on? Or is now just the time to get the hell out of there because things are about to get ugly? And once you've actually played with him in that mode and you start just raining meteors and swiping with your hammer, you truly feel awesome. People are running from you in fear. He instantly changes the game, and in essence becomes another objective where it's like, "Ragnaros is in that thing. Do we engage him or not?" It's going to create some interesting situations and it will be interesting to see how players react. Q: Do you think you will be exploring further down this path with future heroes? Alan Dabiri: It is something we would like to explore. One of the great thing about Heroes is that we can try things. We can try some wacky things. If they work and the community accepts them, we can keep doing more. Or if for some reason things didn't work out so well, then we have the option of downplaying that and trying something else. But I can see us making more heroes like this in the future. But ultimately, it will be the fans that decide just how that goes. Q: Another new addition is the brawl mode. Can you tell me a bit about it? Alan Dabiri: We just came out with it. It's an awesome new mode. This is our third brawl, so it's only been three weeks. It's been really cool; players have been super excited, and we've actually had a lot of people playing the mode. It's a fun place where we can bring in game modes that completely break the game. We've already talked about Heroes as a whole kind of breaking the genre so to speak. 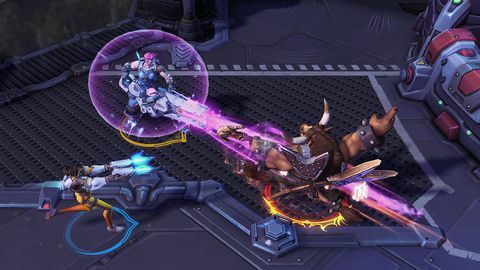 Well, this is a way for us to break Heroes of the Storm as well, allowing us to try things that normally would not be possible, like making every player the same hero, or removing cool downs, or any other normal restrictions in the game. Or things like we just released with Lost Cavern, which is a single lane map focusing on more of that ARAM style that has existed for some time. Or what we've talked about here at BlizzCon with Blackhearts Revenge, which is an entirely new battleground with brand new victory conditions. You've got this asymmetric battle where only one side has a core. So it's one side's job to push Blackhearts ship down the map, and the other team has to collect cannon balls to fire and destroy the ship. Q: MOBAs have become a major tent pole in esports and live streaming, eclipsing traditional RTS and FPS games. Where do you think Heroes of the Storm fits in that market? Do you want to be going head-to-head with other MOBAs, or are you more interested in forging a different path? Alan Dabiri: I think that Heroes is finding its place with the community with our esports side. We have had a fantastic 2016 finished off by the tournament here, with the great event we have going on. Next year we've kind of leveled it up even more: we are going to have a full organized league with HGC with contracted players, full teams in multiple regions. I think that going to make Heroes even bigger in regards to esports. This we feel with give us even more opportunity to highlight the game. Q: What were your motivations for creating the league, and what are your hopes for it moving forward? Alan Dabiri: Primarily it's about consistency and stability for the players, and building stories. Once we've actually got these fixed teams, we're supporting the players to actually stick with those teams and develop a storyline between rivalries. Being able to support that ecosystem is a very cool opportunity for us. It means you'll understand what this team means when faced against that team. So, we're building these stories for every player and team as we again drive towards the ultimate clash here at BlizzCon. It adds something new and exciting for players and fans. 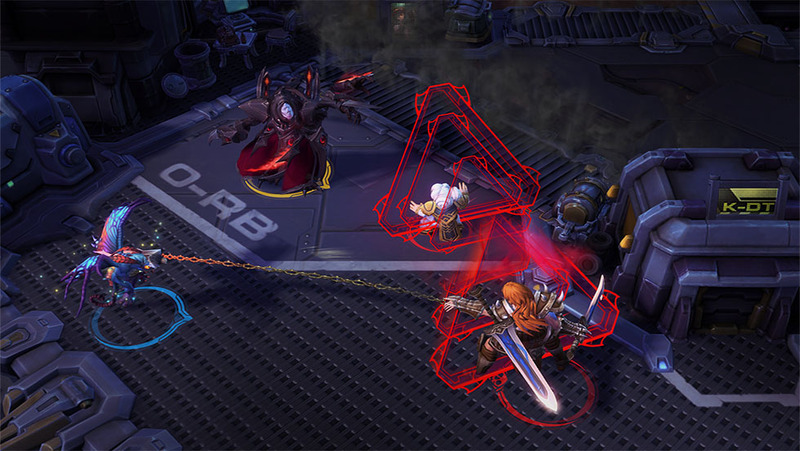 Q: What do you feel is the best feature of Heroes of the Storm that differentiates it from other MOBA titles? Alan Dabiri: The number one thing for me is that we are defying the genre, we are kind of breaking the mould of what the genre is. 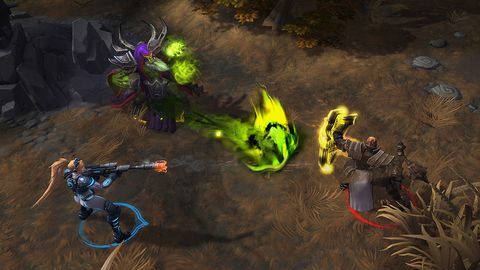 There are a lot of games in this space that may have similar characteristics, but with a lot of the things we've talked about with our leveling, and talents, and our unique heroes… these are things that you're only able to get from Heroes of the Storm, because of the nature of the mechanics we have changed, and in my opinion we have improved. We also have the brawler aspect where it is constant team fighting. Going forward I think we are going to continue to level that up even more. Where we are creating these unique and compelling experiences. Q: What is the most important lesson you and the team have learned since releasing the game last year? Alan Dabiri: We historically have been a company where we took a while for things to come out, and we would release an update every now and then. 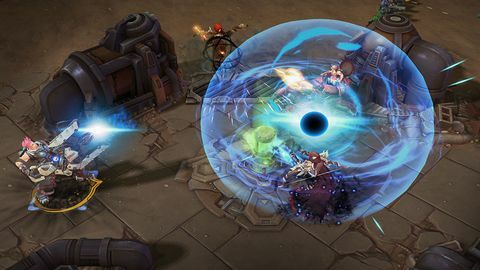 When we released Heroes, we realised by the nature of the game we needed to keep delivering content, new game-play features, and ultimately, balance changes. So while at the beginning we were releasing content fairly quickly, we were a little bit slow on the balance side because we wanted to see how things played out and how things went. As we started releasing so many new heroes the community said – and we saw it too – that we needed to be much quicker on this. And so we went up to releasing balance patches almost every week, so we were making quick reactions to things. We release new content every three to four weeks, and major features every six to eight weeks. These are important things we learned, but also we learned from players that maybe we should not be so quick to release balance updates. So we are trying to find the best timing. We have the ability to make changes every single week, but now we are focusing on using those tools when its most appropriate. Using what we've learned to react when appropriate or to take time gather data to make better decisions. 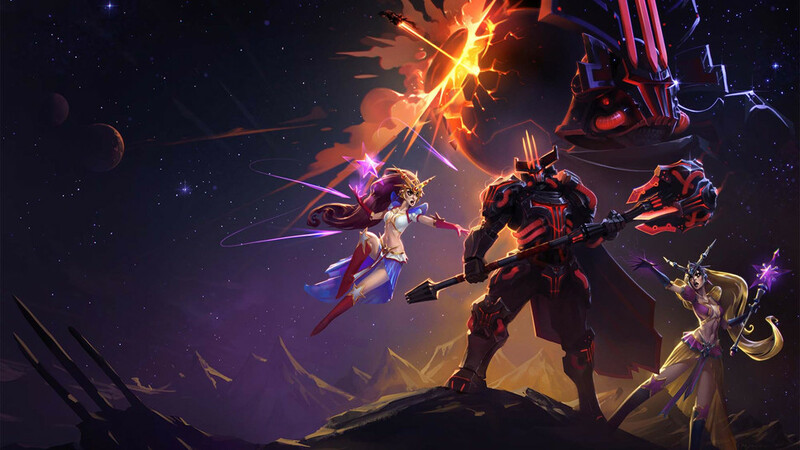 Q: Where does the Heroes of the Storm community fit into ongoing development and support of the game? Alan Dabiri: The most important factor is our communication with our players. It's key because we are moving so fast and releasing stuff so frequently, we think that that connection with the community is very important. We have a lot of our developers out in community spaces, whether it's on our forums, or Reddit, Twitter or other things like that. We also have our fantastic community team getting feedback. We also have regular feedback with team going through what the community is talking about. It's great, things that the community is talking about we are able to get into release a couple of weeks later. 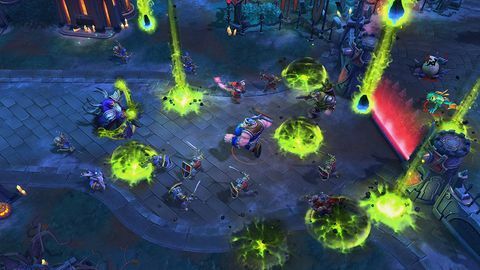 Q: Where do you see Heroes of the Storm heading into 2017, and what are your hopes for the game? Alan Dabiri: Just growing. We are going to continue to push the game, and try newer and innovative things. We are going to grow our esports space. We're going to keep adding more gameplay features, and we are going to keep refining the things we have. Even from the beginning on our hero design, our philosophy has slowly shifted as well, and we are improving on how we are designing our heroes. We will even go back and refine some of our existing heroes going back to that philosophy of giving players multiple choices when going in to a match.